Ten years ago, comics lost one of its popular creators far too soon. Mike Wieringo passed away, leaving a legacy on two popular comics (The Flash and Fantastic Four) along with numerous other projects and the co-created series Tellos. His style, which often featured large feet (making him the anti-Liefeld, perhaps? ), was extremely distinctive and his "Ringo" signature made it easy to spot his work on a cover, back when covers related more closely to the inside plot. In honor of Mike's legacy, a new award has been created in his name, in the tenth anniversary of his passing. And before you say, "Another award?" keep in mind that this one has a very unique feature--the nominations are a combined process of open nomination and also jury selection. And the open nomination isn't just for industry figures, either--it's open to all in the comics community. Two nominees will be selected by an open, online nomination process. The remaining three nominees will be selected by a jury of comics industry professionals. A tie among the jury’s choices may result in more than five nominees in a category. Nominees will be listed in the ballot alphabetically with no distinction made between open- and jury-selected nominees. Nomination voting opens June 27, 2017 and will close July 18, 2017. Nominees are targeted to be announced July 26, 2017. The comics creative community will vote online from July 26, 2017 to August 16, 2017 to select the winning recipient in each of these categories. It's a neat idea, letting fans in, but not letting the ballot get stuffed completely, as can happen when there's completely open voting. Additionally, you must have an e-mail address linked to your nomination, reducing the amount of multi-voting that can be done. No system is perfect, but I really like how they've handled this. Come get your cool badge! 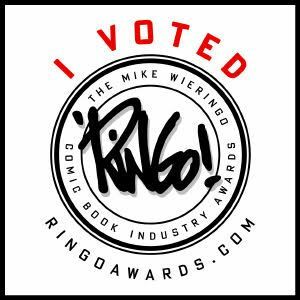 You can visit the Ringo Awards here. But hurry, the nominations end July 18th!